But when I stopped in at the running shoe store for yet another pair of running shoes, I saw a shirt with the phrase, “It’s a Marathon, Not a Sprint…Trust the Process.” That phrase engrained itself into my heart and I successfully completed my first marathon in the October of my 3L year, coincidentally one month before I received an invitation to join another type of marathon, a job offer to become a lawyer. 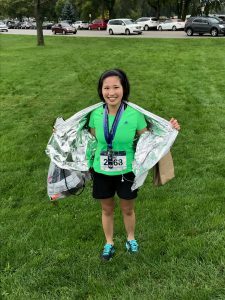 It has been five years since I started law school, and as I look back on my time in law school and first years as a practicing attorney, I realize that these past five years were similar to my marathon training. In law school and in the legal profession, there are times where it’s easy to lose sight of the end goal and to feel like the path is never-ending. However, much like a training session, with each outline finished, each assignment completed, and step taken, you travel that much closer to reaching your goals. Law school and practicing law can be uncomfortable and unthankful at times, but it’s important to remember that the path to becoming a successful lawyer is a marathon, and not a sprint, and that every step of preparation taken brings you closer to the goal.